EDINBURG — The Vipers are heading to New York. From about mid-way through the second quarter all the way through the third quarter, the RGV Vipers put on an electrifying show, turning a four-point deficit into a 28-point lead during that span en route to a 144-125 victory over the Santa Cruz Warriors on Tuesday at Bert Ogden Arena. The win clinched the Western Conference championship for the Vipers and sends them to the G League Championship against the Long Island Nets. 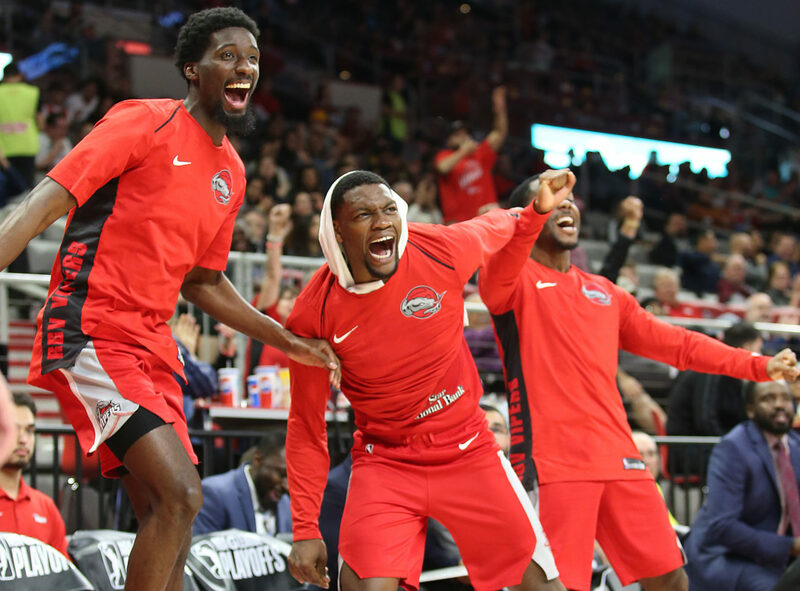 The Long Island Nets defeated the Lakeland Magic in the Eastern Conference final 108-106 on a buzzer-beating 3-pointer on Tuesday night as well. The first of the best-of-three series begins at Long Island on Sunday. The Vipers will then host the Nets Tuesday. If a third game is necessary, it will be held at Long Island on Thursday. In their only matchup, the Vipers lost 110-100 to Long Island at the Winter Showcase in Las Vegas. The Vipers are looking for their third G League Championship. Gary Payton registered a triple double and led a defensive surge with 10 steals and a blocked shot to go with 10 rebounds, six assists and 20 points, most of those stats coming during a 43-point second quarter and the first part of the third quarter that kept the raucous crowd on their feet. The Vipers scored 74 points between the second and third quarters. The Vipers led by as many as 28 points and held a 106-86 lead after three periods. There were 16 lead changes leading up to the point where the Vipers took over at 55-53 on a Chris Walker dunk. Dakari Tucker had a scalding hot touch, hitting 6 of 11 3-pointers and finishing with 28 points. After a slow start, Michael Frazier started lighting it up and ended with 24 points, including a four-point play in the lop-sided second quarter. The Vipers converted on 21 of 46 3-pointers. The Vipers were turnover heavy in the first quarter plus, but then stingy man-to-man and help defense ended up forcing Santa Cruz into turnovers. By the end of the game, the Warriors had turned the ball over 24 times and RGV scored 28 points off them while the Vipers had 24 turnovers and the Warriors scored 25 from those miscues. The Vipers led 75-59 at the half after a frenzy-like run led by Dakarki Tucker’s long-range shooting. The Vipers trailed 50-46 before finishing out the half on a 29-9 run. Tucker scored 16 points, including four 3-pointers, during the run. Gary Payton restored the lead earlier in the period to the Vipers following a 3-pointer as the Vipers defense – led by Roger Moute a Bidias and Payton dug in. Two plays later, Payton caused another turnover, pushed the ball up to Michael Frazier who then lofted it toward the rim for a thunderous dunk by Chris Walker that sent the crowd into a frenzy and the Vipers led 55-53. Tucker got into the action next with a reverse layup and a 3-pointer that again sent the large crowd to their feet and suddenly the Vipers held at 60-53 lead with 3:04 remaining in the first half. Tucker hit another 3 after the timeout and the Vipers lead was pushed to 10, 63-53. Walker added another dunk in the period and newcomer Trevon Duval scored four in the final minute of the half. The Vipers trailed 38-32 after the first quarter, turning the ball over eight times leading to 13 points by Santa Cruz. Daniel Hamilton came off the bench to score seven points and spark the offense but committed three turnovers during that time span that led directly to six points. The Vipers shot 50 percent from the floor in the period but was only 2 for 7 from the free-throw line. The teams came in with identical regular season records at 34-16. The Vipers took the season series 2-1 and all three games were under 100 points for each team. Early on that trend looked like it wouldn’t continue as both teams lit up the net and the Vipers led 27-25 with more than four minutes remaining in the first period.